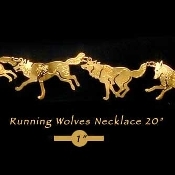 Subjects >> Running Wolves Necklace 20"
Seven running wolves- all in different postures and gestures leaping and scurrying around your neck. A fabulous looking work of art that will give you a connection and talking point to let others know you love wolves. Each necklace is hand crafted. Shaped and connected with two lengths of chain at either end to finish the 20" length and to make it comfortable while worn. Pictured here in 14k gold plate finish but also available in a durable rhodium silver finish. Just change the options box!